I just wanted to check in on you and say hello and that I'm still alive. I'm sorry for not blogging, but I'm in New York! By the way I got some new stuff. Right now my cousins are in camp so I'm chilling on the couch with my 8 year old cousins macbook and a cup of tea. After this post I'll be watching "Forbrydelsen" which is a great Danish tv show. It's insane that she has one when she's so little. Whats up? I'm so so so sorry not for blogging these days. Like I said in another post my computer broke down with a virus, so I can't blog which is horrible. I know I'm not getting a new computer now, but I'll work it out. I'm just going to blog from my phone and when I'm at my friednds house. Well, now i'm just sitting here waiting for tomorrow, haha. I'm really exited going to New York. It's so long time ago I was there. Woah, the last tine I was there was when I lived there. However, I'm not going to be blogging the next three weeks either. Or maybe I'll just check in with my outfit or some new ins, who knows? I'm planning on getting some sneakers with me home and maybe some nice boots. A nice fringe bag, a couple of pullovers, some jeans that aren't black or maybe some leather pants, leather shorts would be nice too, I wouldn't mind a neon belt either, some good quality tees is a must together with a nice foundation or some pressed powder, I won't go home without some sassy underwear either. I did my last cravings now. Do you like them? I think I'm in love. I don't fall in love a lot, but when I do I really fall in love. I can't think clear. I can't sleep at night. That's how it is right now. Be mine. Be mine. Be mine thats all I think of. This time my love is to this beautoful finge bag. It would fit with everything from neon shorts (like this lovely outfit) to leather pants and biker boots to galla dresses. I hope we'll get together someday and have a serious realtionship. 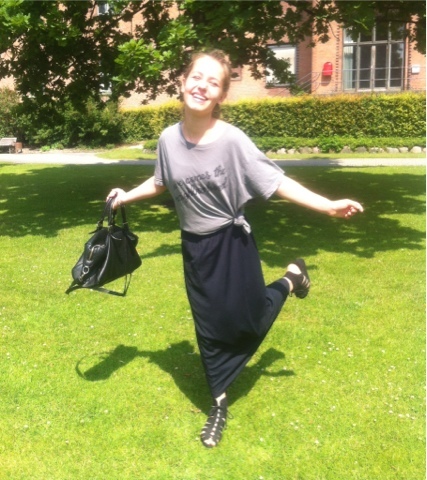 What I'm wearing: shirt - alternative vintage soft (given at Tribecca film film festival), skirt - ?, shoes - H&M, bag - Barata and Ramilo, bracelet (I know you can't see it) - Ludvig. Here is what I'm wearing on this hot summer day. It's 23 degrees (about 75 F) here in Copenhagen. Doesn't that sound lovely? I'm planning on going to the beach later. This year I've falled in love with maxi skirts. They're great for a day where its a bit cold, a day where you are going to the woods (brændælde secured, haha) and days where you just don't feel like wearing something short. Do you like maxi skirts or do you think they're a bit "mother-ish"?